The first trading day is bullish for DJIA, S&P 500 and NASDAQ. Average gains on the first day over the last 21-year period are right around 0.5%. Strength then tends to fade after that until the stronger eighth, ninth and eleventh trading days. Presidents’ Day is the lone holiday that exhibits weakness the day before and after (Stock Trader’s Almanac 2019, page 88). The Friday before this mid-winter three-day break can be treacherous and average declines persist for three trading days after the holiday going back to 1980. 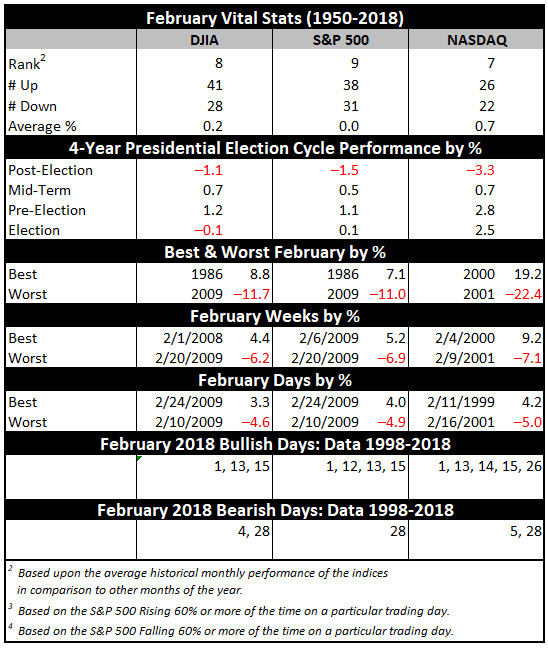 In pre-election years, February’s performance generally improves with average returns all turning positive. NASDAQ performs best, gaining an average 2.8% in pre-election-year Februarys since 1971. Russell 2000 is second best, averaging gains of 2.5% since 1979. DJIA and S&P 500, the large-cap indices, tend to lag with average advances of around 1.0%.